Lemongrass Bliss has a new name, formerly known as Lemongrass & Sage, Lemongrass Bliss is the same exact product with a new name! Lift your spirits with the fresh, crisp aroma of Lemongrass Bliss! Our hand and body lotion is scented with 100% pure therapeutic grade Lemongrass and Sage essential oils, it hydrates, nourishes and replenishes your skin while leaving you smelling fresh and feeling happy! And, the scent lasts a long time! Wash with Lemongrass Bliss bath and shower gel and finish up by treating your body to Lemongrass Bliss hand and body lotion! You will love how you smell! 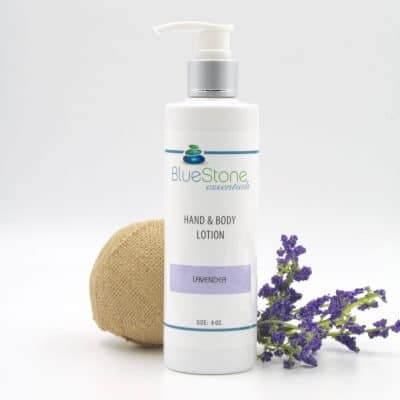 BlueStone Essential’s Lemongrass Bliss Hand and Body Lotion offers carefully selected plant-based ingredients and the luxurious feel of genuine Essential Oils. It spreads easily and absorbs fast, providing nourishment in abundance. It soothes dry, sensitive skin and adds plenty of moisture to keep the skin supple, healthy and youthful. A unique formulation of Soy, Jojoba, Coconut and Palm extracts in combination with pure therapeutic grade essential oils restores the skin’s natural balance for radiant health. Ingredients: Purified Water, Glycerin (from Coconut Oil), Stearic Acid (from Coconut Oil), Pure Plant Oil Complex (Soy & Jojoba Oils), Cetyl Palmitate and Cetearyl Alcohol (from Palm Oil), Pure Therapeutic Grade Essential Oil Blend: Lemongrass (Cymbopogon flexuous), Sage (Savlia officinalis), Vetiver (Vetiveria zizanioides), Lavendin (Lavendula burnati), Pine (Pinus palustris), Atlas Cedar (Cedrus atlantica), Jasmin Sambac (Jasiminum sambac), Cardamon (Elitteria cardamomum); Poly Sorbate 80 (from Palm Oil), Glyceryl Stearate (from vegetable sources), Cetyl Alcohol (from Palm Oil), Aminodimethicone (from Silica), Phenoxyethanol and Ethylhexylglycerin (mild preservatives from plant sources) Certified Organic by Quality Assurance International. I live in a very dry climate, and I’ve been using coconut oil on my skin for moisturizer. While it works, it also means I have to air dry for hours before I can put clothes on or my clothes get all sticky. What’s AMAZING about this body cream, is it gives me the same results as the coconut oil, but it dries super fast on my skin while still moisturizing it. In addition, the smell is refreshing and my clothes don’t get sticky! I am in love with this lotion. While some lotions seem to lay on the skin and transfer to my clothing and my coffee cup, this lotion is actually absorbed into my skin. I noticed the difference right away. No greasy residue, And the aroma is heavenly!